I haven't done a dyeing post in awhile. Why not? Because discovering that my hex code dyeing posts had been stolen, really knocked the wind out of my sails. I had worked hard for my first success, but having to deal with the stolen content distracted my concentration for converting hex codes into Procion MX dye recipes. This doesn't mean that I've completely given up on the project. It just means that I will have to collect my notes and my motivation for a fresh experiment. What I want to blog about today, is the results from an experiment I started two months ago, using the exhaust from my Procion MX dyeing. 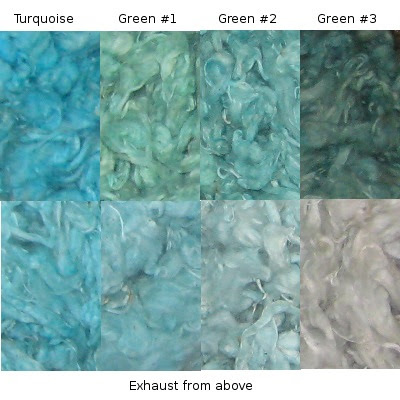 By "exhaust," I am referring to the color left in the dyebath after the primary object has been dyed. "Exhaustion," is technically the process in which dye molecules move from the dyebath and attach onto the fiber. 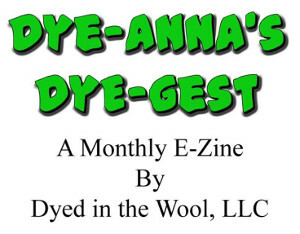 When as much dye as possible has attached itself to the fiber, the dyebath is said to be "exhausted." 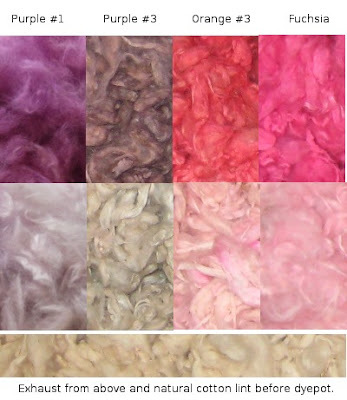 Until the Online Guild Vegetable Dyeing Challenge, all of my dyeing experience had been with acid dyes on wool, mohair, and angora. With acid dyes, the dyepot is rarely completely exhausted. 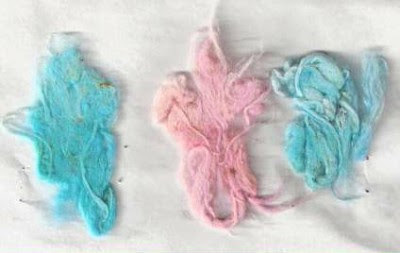 It's often possible to continue to dye with a used dyebath, getting progressively lighter shades of the original color. Now theoretically, there is no exhaust from Procion MX dyes. This is because in an alkaline environment (created by the addition of washing soda, aka soda ash or sodium carbonate), the Procion MX molecules in the dyebath will bond not only to the fiber, but also to the water molecules. That means that even though the leftover dyebath may retain a lot of color, the dye molecules left in the dyebath are unavailable to dye more fiber. Even knowing this, I deplored the apparent waste of dye when I poured out the used Procion MX dyebath. So I started experimenting. As I worked on the challenge, I would pop more scoured cotton lint into the exhausted bath and leave it sit for a couple of days. For some colors, the fiber would look as though it had taken the color, all of which would wash out. However, I did have some interesting results with anything that had turquoise MX-G or fuchsia MX-8B in it. The results of these experiments are in the next two photos below. At the top of each is the cotton lint from the original dyebath. The recipes for each of these can be found on this post. At the bottom of each photo, are the samples I got from the exhaust of each of the above. In each case, the fiber sat in the exhaust for at least 48 hours. It is interesting to note that the exhaust experiments which came out palest (green #3 and purple #3), had neither turquoise (Turquoise MX-G) nor fuchsia (Red MX-8B) in the recipes. This wasn't in keeping with everything I'd read about Procion MX dyes, so when I reported the results to the Online Guild, I was curious whether anyone knew what was going on. It was suggested to me that the exhaust samples probably wouldn't have the lightfastness typical to PMX dyes. Ever the "see for myself" soul that I am, I set up a second experiment. I put three samples onto a piece of paper, folded the paper to cover half the sample, labeled them, stapled the paper, and taped it to my bedroom window with the fiber samples facing into the sun. This window gets the long, baking, hot afternoon sun. I figured if there would be any color deterioration, this would be the place for it to happen. That was two months ago. Yesterday, I took the paper down to see what had happened. 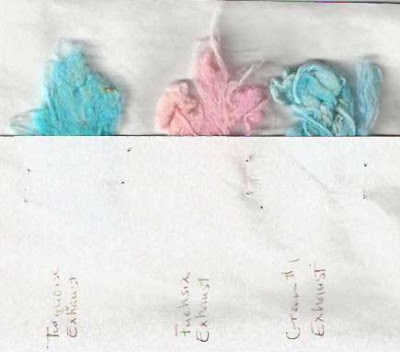 In the above photo, you can see that the ink faded, but what about the color in the fiber? See the results below. Yes, there was fading, but not very much! It is so fun to read your experiments. I can't wait to get into my house so I can't try drying. Have you ever used plants to dry your yarn? Interesting!!!!! I like the fading experiment too. I once had a demin jumper I put away in a dark closet over winter and it faded. To this day I can't figure that one out. Actually, with acid dyes, if you've done your calculations correctly, and if you have used good dyeing techniques, there should be no dye at all left in the dye pot when you are done. Imperfect as I am, especially with arithmetic (! ), my finished dye pots have a little bit of dye, but the water is really very very pale. Another good reason for using acid dyes for appropriate fibers. Fabric dyers using MX dyes frequently use the leftover dyes for just for fun things, especially when they have several colors. Sort of like making more than one pull with a monoprint. Wow, that is a great experiment! I love that you don't just blindly trust the experts, but try it for yourself! Interesting results, but I can't help but wonder if anything you had put through a two-month period in that hot window wouldn't do the same. Too bad its too late in the year to try something that's supposed to be colorfast. I was wondering if you add anything to the exhaust to bring out more of the color? When I dyed with sabracron before my professor said that if we wanted to use the exhaust that we needed to add more salt and soda ash to reactivate the dye. I'm not sure if this would be the same with the procion, but it might be something else to add to your experiments. Thank you one and all! Jewel, I'll have to share my natural dye samples with you. Barb, I'm learning that dyes are curious things. Especially the so-called direct dyes, which don't seem to be very fast at all. Dyeing is really quite a science. Sharon, I agree that nothing is absolutely color fast. And we all have closets full of clothing with which to prove it! Peg, I agree that the most satisfying acid dyeing is when the dyepot turns out clear in the end! Though it is fun to have a couple of paler shades of something. Lavendersheep, that's an interesting comment. I will have to look into that.